The acronym AFF stands for “Accelerated Freefall.” How’d it get that name? Well, you’re not falling any faster (as the moniker would imply). It’s called “Accelerated” because it’s the quickest method of experiencing solo (non-tandem) freefall. Yes–you read that correctly. When you do your first AFF jump, you’ll be jumping from the airplane from 13,000 feet with your very own parachute and no tandem instructor. No other method of learning to skydive offers that opportunity. Sure–you won’t be “alone” in the strictest sense–you’ll be assisted hands-on by two certified instructors (and packed full of a full day of classroom training). Regardless, you’ll still have a sense of independence–and feel like you’re under your own power–and that’s gold. Want to know if this training method is right for you? Read on, dear new friend. What is learning to skydive like via the AFF training method? It’s a thrilling challenge! It’s easier, however, than you might think. Your AFF process begins firmly on the ground with a full day of classroom training. That “ground school” time is tremendously important, as it helps you get confident in the equipment and procedures that you’ll be using in the sky. What can an AFF student expect before the jump? On the ground, a fully qualified (and United States Parachute Association-rated) AFF instructor will take time to walk you through every aspect of the process. S/he will go over everything you’ll need to know to be safe and have fun: how to use your body’s surfaces to stay stable in the air; how and when to deploy your parachute; how to conduct that parachute safely to the ground. You’ll also drill emergency procedures until they’re second-nature. What can an AFF student expect during the jump? After ground school, you’ll start to demonstrate your skills in the sky. In AFF, there are eight levels to master. Each level equates to one AFF jump. Each AFF jump is an independent unit–like a chapter in a coursebook–with a checklist of maneuvers to learn and demonstrate. You’ll advance to the next jump after you prove to your instructors that you’re able to successfully complete all the maneuvers on the checklist. On your first jumps, you’ll be sharing a very small slice of the sky with two hands-on instructors; later in your progression, only one will be at your side. What happens after AFF’s eight levels? With your eight AFF levels complete, you’ll jump 17 more times with a coach (not a hands-on AFF instructor). Once those are done, you can apply for your USPA “A-license.” That A-license is your passport to the sky! You henceforth have the green light to jump alone and start developing all the new skills you’re undoubtedly thrilled to tackle. 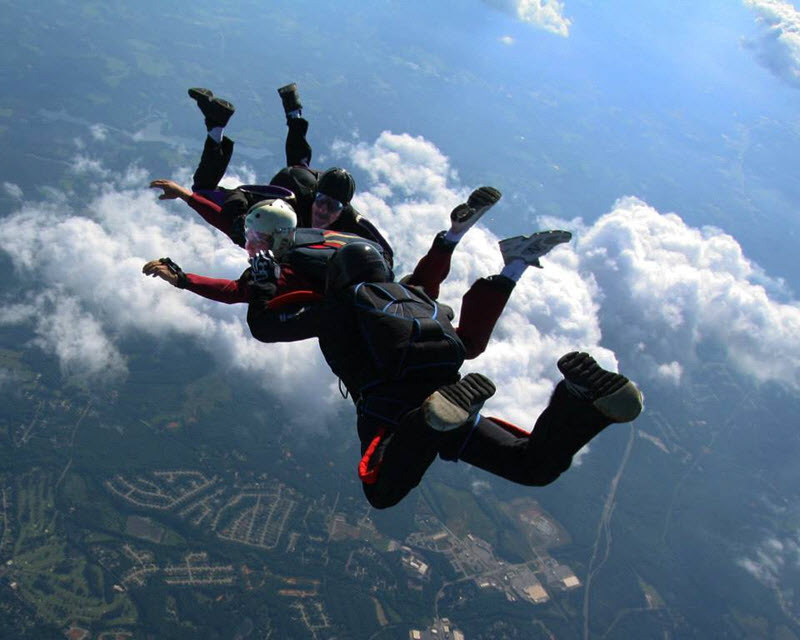 Why choose Skydive Monroe for your AFF? To put it simply: We’re great at it, and we care! We’ve taught thousands of people just like you at Skydive Monroe, and we’re proud to report that these folks have gone on to be amazing skydivers in their own right. When we check out our old student’s Facebook and Instagram skydiving shares, we get so stoked–because they’re Skydive Monroe family. Every one of ’em. We want you in the family, too! Sign up today. Still have questions? Get in touch. Our staff will be happy to help.